Affordable housing & homelessness – In the UK buying a house is out of reach for most people, particularly young people. Renting is also often out of reach for many, which can lead to homelessness. Climate Change, Waste Disposal & Pollution – The way we are living our lives in the 21st century is environmentally unsustainable. We need to reduce our carbon footprint and live in closer harmony with our surroundings using the principles of permaculture. It will adopt a permaculture approach that creates an environmentally friendly way to tackle homelessness and a lack of affordable housing. 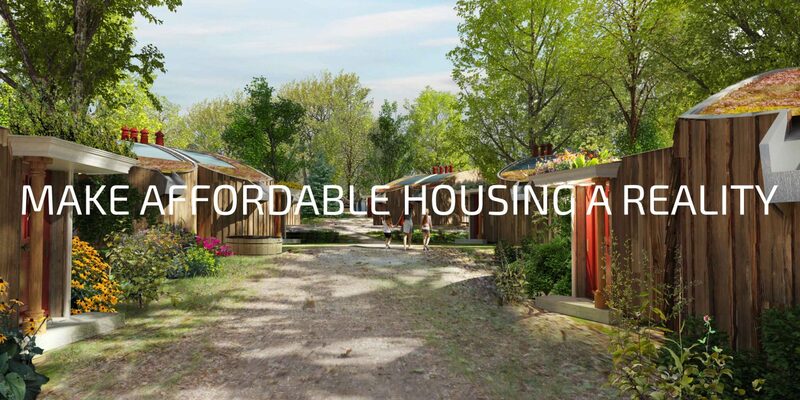 The eco-village will enable people to afford their own house, and be able to live in a more sustainable and “Green” way. Our affordable wooden eco-houses have been designed in a kit format. These can be made locally and delivered on-site as complete units requiring only quick, simple assembly. They can be off-grid with solar powered under floor heating, rain water recycling, grey water recycling, compost toilets and solar energy generation. * CIC – This is a Community Interest Company which uses all its resources for community benefit. It is an asset-locked company which ensures that funds are solely utilised for the purposes laid out in its statutes and articles and its accounts are audited and made public.